The statue of Joan of Arc, by Emmanuel Fremiet, stands on Decatur Street. Fremiet, a French sculptor who lived from 1824-1910, is known for his historical figures and characterizations of animals. 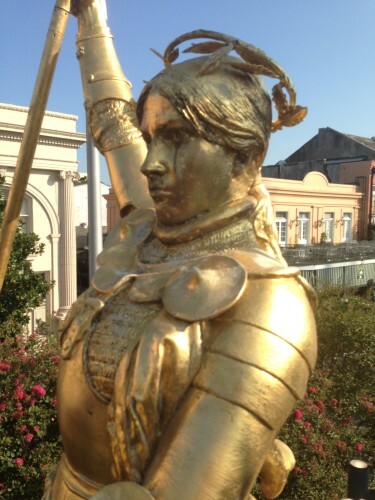 A reminder of New Orleans’ close ties to France, Joan of Arc was commissioned by Emperor Napoleon III in 1875. Sent to New Orleans on consignment in 1958, she remained in storage until 1964 when Charles de Gaulle and the cities of Orléans, Paris, Rouen and Rheims bought the statue and donated it to the City of New Orleans as a gift. In 1972 it was unveiled in the Place de France on Convention Center Boulevard. Joan of Arc was moved to its present location in 1999. Joan of Arc © Ashley Merlin. There was much controversy when the original Fremiet Joan of Arc was created in 1874. 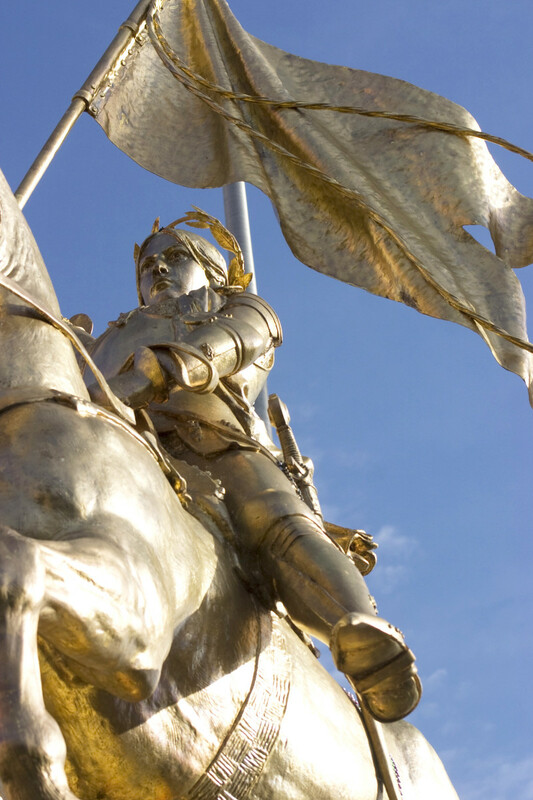 The sculptor felt that Joan of Arc would be the ultimate symbol of national hope. The City of Paris commissioned a life size version of Joan, and erected it in February 1874. The location selected was believed to have been the spot where Joan of Arc was wounded in 1429. The statue soon became a target of criticism and protest. People also disliked the statue because she was shown in armour instead of dressed as a page, and seemed too small atop the horse, almost masculine. As the years passed, people slowly began to accept the statue. However, Fremiet never got over the damage done to his status, and it haunted him. He revisited his initial concept of Joan of Arc when the City of Nancy asked for a replica of the Paris statue. In 1889 he made a second life-size statue for the Paris Salon. This second version was welcomed with more acceptance than the first, as Joan appeared more heroic. Minor changes in this version included covering the horse’s face with a chanfrein and removing the harness traps from the back of the horse. These slight alterations brought the focus onto Joan instead of the horse. Fremiet then cast two bronze casts of this version – one installed in Nancy and the second bound for Philadelphia. Strangely the contract Fremiet signed with Philadelphia stated that there would only be 3 editions of the statue (Paris, Nancy and Philadelphia). Fremiet always wanted to replace the original 1874 statue in Paris. He then set about casting a 3rd life-size bronze of the second version for himself. Fremiet kept this a secret, even from his wife. In April 1899, he learned that the construction of a new Metro station might endanger the statue. He petitioned to move the statue to the safety of the bronze foundry, Barbedienee, until the construction was completed. After ten days the statue was returned to its location. On May 16, 1899 Fremiet revealed a new, beautiful gold statue. To much surprise, it seemed that, while the statue was at the foundry, it had been gilded. In truth, Fremiet switched the first and second versions. In addition, Fremiet instructed Barnedienee to melt down the first and only original cast. It took Parisians 4 years to recognize the switch. Fremiet admitted the switch in 1903 to the press. Overall, there are six Fremiet Joan of Arcs in three variations: the original in Paris, in Nancy, France, at the State Library of Victoria in Australia, in Philadelphia near the Museum of Art, another in Portland, Oregon, and of course the famous version beloved here in New Orleans. The parade begins at 7:00 pm at Toulouse and Decatur Streets, and stops on Conti for the annual Jeanne d’Arc Royalty Toast, coordinated and hosted by the Historic New Orleans’ Collection Williams Research Center, with remarks by HNOC director Priscilla Lawrence and the Consul General of France in New Orleans, Gregor Trumel. It will conclude at Washington Artillery Park for the king cake ceremony, where the Maid of Honor crowns this year’s King, Eric Belin, President of the French American Chamber of Commerce, and her “birthday cake” (a king cake, naturally) is shared among the 2016 Royalty, with welcoming remarks and congratulations offered by Queen Yolande of Aragon, portrayed by Sandra Dartus, Partnership Liaison, FestiGals, Inc.
Joanie on the Pony is losing her gilding. She symbolizes strength and perseverance despite all odds, something that New Orleanians truly understand and appreciate. To help with her restoration and make her stand tall once again, please visit www.monumentaltask.org.